If you’re reading this it’s likely we’re friends. Or that we have a friend in common. That describes most of my readers, which makes me happy. I’ve been thinking a lot about friendship lately and what it really means. I used to believe friends were like family. I wanted to believe that, but it’s not really true. Friends will quit you, you’ll quit them, or together you’ll go on long silent unintended hiatuses. If we’re being honest, those things rarely happen with family. In Friendkeeping, Julie Klam’s marvelous collection of personal essays about friendship, she posits that friendship can take many forms. But that regardless of the inevitable ups, downs, and separations short and long, the friendships women have with each other are a stabilizing force like no other. Click here for a link to Julie's book. Reading Friendkeeping I got inspired to reconnect with an old pal. We’d become distant due to living a few hours apart and having young kids. The warmth was still there. We blew each other kisses on Facebook once in a while, but the intimacy we’d shared during our younger single days in San Francisco was gone. In truth, I didn’t really know her anymore. That made calling her out of the blue seem weird. Not sure about you, but finding time to talk on the phone to friends is nearly impossible for me. First of all, I talk for a living. I’m on the phone or in person with colleagues and clients nearly constantly. When the workday is done I chatter with Aspen and Jonathan for a few hours before dozing off in her bed as I snuggle her to sleep. When I rouse myself and stagger out of her room the absolute last thing I want to do is pick up the phone and gab with a girlfriend. Sound familiar? Whether you have kids or work or not, I’m sure you've got your own version of overload that makes a real, juicy, human phone conversation a rare luxury. Remember being a teenager, twirling that coiled phone cord around your finger for hours? Going over the day’s events with your girlfriends? The same girls you’d just spent the whole day with, and with whom you’d reunite early the next morning? Talking on the phone meant sitting in one place and doing nothing else. Not just because multi-tasking wasn’t a thing back then, but because the phone was bolted to the wall. Ha! We were present with our friends back then and they were present with us, but we wouldn’t have called it that. Talking and listening intently is just what we did. Nowadays if I find two minutes while I’m flying around doing errands to talk with a girlfriend it’s usually rushed and superficial. More of a check-in than a conversation. I suppose that’s better than a Facebook Like, but it’s not the same as a deep connection. And if you go on too long like that with someone, you’ll find you’re just not that close anymore. As Julie’s book got me thinking about some of the friendships I’d let lie fallow, I got sentimental about a friend or two and decided that, by golly, I was going to reach out and leave one of my old friends a voice mail. Are you laughing that I thought leaving a voice mail was the same thing as reconnecting? So I dialed. And what do you know? She answered the phone! We were so happy to hear each other’s voices. She’d just started a hike with her dog, and I had a break in my schedule so the timing was perfect. It wasn’t weird at all. She’d recently moved to another state, which meant our chances of seeing each other any time soon had plummeted. I hadn’t even gone to her going away party. Because. You know. Traffic. So we had a lot of catching up to do. Right away we were off the superficial and onto the real life stuff. Which for her includes cancer in her family, and the fact that her child had just been diagnosed with a stinking rotten unfair affliction that he does not deserve, and that will be a challenge for him the rest of his life. We both cried feeling the weight of that. And we had a deep heart-centered talk. It turns out I had a few helpful ideas for her. And that being able to talk and unload to me that day, right when she did, eased her burden just a little bit. And it sure filled me up. Turns out we were still close. We just needed a few minutes of friend phone time to remember that. I’m so glad I called her. Do you have a friendship that’s been wasting away? Yep, that’s her. The one who popped into your mind when you read that. Don’t read me wrong: my mom friends are the bomb. I love every one of them. And I’m committed to fanning the embers of friendship now so rekindling later won’t be needed. But it’s the Way Back Machine friendships I’ve been stoking lately. 1. Call a long lost friend. She’s probably not really lost, and I bet you’ll find you have as much in common as you used to, even if your lives have moved in totally different directions. 2. Answer the phone. Next time a friend, old or new, rings you up, consider answering. Talking live to hatch your next plan will feel more satisfying than texting. Hearing, “I can’t wait to see you later!” is a lot nicer than reading "C U There." 3. Block out time on your actual calendar for an actual event: An hour of phone time. Spend it dialing up old and new friends alike. Sit in one place while you do it, and don’t multitask. 4. Make a standing date. I’m part of a wonderful group of mom friends that meets out for dinner at the same place on the first Thursday of every month. It’s on our calendars so we prize and prioritize the date. I hope just thinking about your friends has put a smile on your face. Thinking about you put a smile on mine. P.S. My next post will continue the friendship theme with a formula for easy get togethers with good friends. P.P.S. Forward this post to an old friend to break the ice. I’m guessing it’s thinner than you think. Here's my bestie Emily Baker loving up on Aspen when she was three. We've been friends since 7th grade. If you enjoyed this, please Sign Up and you'll get an email next time I post something for you to read. And add jennie@myhappyplaceblog.com to your address book, too. Especially if you use Gmail, and even if you don't. Thanks! I've had a lot of fun this summer, and here are 5 things I found to prove it. They're odd. And each one is awesome in its own way. Living here in Marin we're lucky to be able to take easy day trips to wine country. At Artesa Winery in Napa you can do something rare -- buy a glass of wine and drink it. None of that tasting nonsense. If you don't live in San Francisco and have been dreaming of a trip to California's wine country let me know and I'll share all my best tips with you! Our fabulous friend John Beauparlant throws a fabulous party every July to celebrate the birthday of his muse, Jackie Kennedy. An artist with a keen hold on the intersection between beauty and irony, John creates unforgettable print collages to honor this icon of American glamour. This year would have been Jackie's 87th birthday so to celebrate her life (and John's art) he invited us to his flat in San Francisco where we sipped champagne and snacked on "Jackie parfaits" in our most elegant attire. Here's one of my favorites. It's Jackie wearing a dress John made from pieces of a van Gogh print. Vincent vG was Jackie's favorite artist. Who knew?! John knew. My sister-in-law Kellie had one of these Scrub Daddies in her kitchen when Aspen and I visited this summer, and it is AWESOME! I'm not just saying that because it's a happy smiley face. 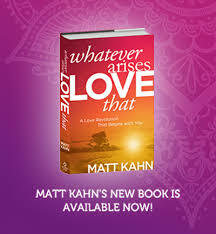 I mentioned Matt Kahn in my last post and then spent the summer being inspired by his warm, accessible, and oh-so-powerful spiritual talks on YouTube. He's coming to Berkeley in November so Jonathan and I are going to see what he's like in person. Let me know if you want to join us! I know I'm supposed to wear sunscreen every day, so why do I resist? Because most of them are thick and icky, that's why. Here's one with a light tint that goes on on like a dream, doesn't smell, and has skin-enhancing properties that make me happy to put it on every morning. What've you discovered this summer that you can't wait to share? And while you're in a sharing mood, please share MyHappyPlaceBlog.com with someone who'd enjoy a quick hit of Internet happiness. *It totally sounds like I'm getting paid to promote this silly sponge. I'm compensated exactly zero for any of the products, services and places I share with you.